There have been a number of articles, blogs and tweets posted lately about pairing wine with your favorite fast food. Let’s face it, as bad as it is for you, there are times when fast food tastes just so darn good! Even the most revered chefs have been known to satisfy their taste buds through the drive-thru. 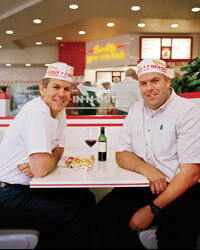 Most notably, Thomas Keller, of Napa Valley’s French Laundry, is a big fan of In-N-Out burger. I don’t think anyone questions the negative nutritional value of fast food. But when you do indulge, why not enjoy it with a glass of wine? The debate should not be about what types of foods you are allowed to enjoy with wine. The focus should be on what type of wine tastes best with what you eat. While we have not tried wine with McDonalds, we have uncorked a bottle with other fast foods, including Keller’s favorite, In-N-Out…and it was awesome! (Two Favorites). We’ve also been known to enjoy a nice Sangiovese with our favorite pizza, Round Table’s King Arthur Supreme ~ with no bell peppers. (A Great Sangiovese for pizza and game night and Cosentino Sangiovese). Regardless of your meal choice, fancy or fast, be adventurous and enjoy it with wine! Posted on August 20, 2011 by Jeff & Sally Toister and filed under Adventures.